I hope everyone had a wonderful Thanksgiving. Ours was relaxing, if you don't count the 7-year old that talked almost non-stop and the incident where we almost got smoked out of the house. I'm not complaining though— I got to stay in my pajamas all day and there was a minimum amount of food prep since I did almost everything in advance, including the turkey. Speaking of turkey, the centerpiece of our T-day feast was turkey confit. In case you're wondering, it was fantastic and I’m not just saying that to make myself look good. I’ve done confit before, but never with turkey and never using olive oil. Let’s face it, turkey can be bland and the flavor of the olive oil could have been overwhelming, but thank the Universe it wasn’t! The meat was well seasoned—not too salty— and fall-off-the-bone tender while the skin was wonderfully crisp. As an added bonus, unctuous turkey juices collected at the bottom of the pan—perfect for making a rich sauce. I highly recommend this method of doing turkey. It's so easy and the results are so good! I first became intrigued by this cooking method after reading Ruhlman and Polcyn's Charcuterie. They do an excellent job of detailing the method and giving good tips. Although I like to experiment with the brine and flavor combinations, I still stick to their basic recommendations, and I've never gone wrong. If you don't have the book, you're in luck because Ruhlman gives the short version for duck here, but the same principles apply to turkey. My adaptations are below. I like to use a dry brine consisting of salt and sugar. Sugar is not traditionally used but I find it cuts down on the saltiness and gives a more well-rounded flavor. Don't worry, the sugar won't give the turkey a sweet taste at all. For every pound of meat, I used 5 grams kosher salt and 3 grams sugar. For the herbs and spices, use any combination you’d like. Thyme, sage and/or garlic are pretty standard for turkey. I was feeling a bit rebellious and used copious amounts of garlic and Chinese five spice powder—very delicious. Rub the brine all over the hindquarters and throw them into a large Ziploc bag or other non-reactive container. They should stay in the fridge for at least one day, but up to two is fine. Be sure to turn them every once in while. To cook the confit, you'll need a vessel with a lid large enough to accommodate the meat and enough oil to cover the meat by at least a half inch to an inch. Upon cooking meats release fat and juices, so take into account that the level of the oil will rise a bit. I recommend using a heavy cast iron or enamel-coated cast iron pot for this, but even a deep roasting pan fitted with aluminum foil will suffice. You will probably be storing the confit for a few days to a few weeks in the cooking vessel, so make sure you don't choose your only soup or pasta-cooking pot for the job. 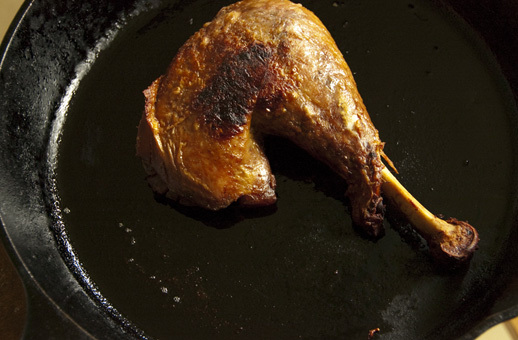 Most people think duck fat when they think confit. Turkey fat is not available and trying to render the fat from a turkey would be like trying to squeeze water from a stone. Certainly you can use duck fat (or even lard), but olive oil works wonderfully. Here's my thought on the matter: Cooking anything in a vat of oil is not good for you, but given the choice between a saturated or unsaturated fat, I chose the lesser of two evils. Resist the temptation to cook at a temperature higher than 200F. Some people cook confit at higher temps, but Ruhlman and Polcyn warn against this and I would take heed. Higher temps may reduce the cooking time but could result in a stringy texture. For turkey hindquarters, expect it to take between 6 to 8 hours. I recommend giving the confit time to develop in flavor and texture— a minimum of a week or up to 2 months.When you are finally ready to serve your confit, it will just be a simple matter of crisping the skin and heating through. Here's what you should do if you don't want a house full of smoke (trust me, I'm talking from very recent experience): Preheat your cast-iron pan over med-high heat and your oven to 375F. Turn on your fume hood. Gently remove the hindquarters from the oil. Blot away the excess oil, otherwise you'll get excess splattering. When your pan is nice and hot, lay the hindquarters skin side down and fry for a few minutes to start the crisping processing. Don't disturb them too much, but make sure they don't burn either. Once you get nice browning, turn the legs over for a few minutes to crisp the other side. Once you have a nice crust on both sides, throw the pan into the oven (or transfer the legs to a sheet pan and put that in the oven) to finish cooking. It's done when the skin is nicely crisp and the meat is heated through. Lastly, don't forget about the unctuous gelee at the bottom of the pot— it can be used in your gravy or sauce. If you used oil for your confit, it's a simple matter of poring off the oil (which can be saved and reused) and scraping up the gelee. It'll probably contain small floating bits so you'll want to strain it at some point. If you missed the opportunity to do turkey confit for Thanksgiving, no worries! December presents a second opportunity. Happy cooking!